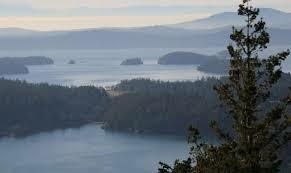 For those of us committed to environmental action this is literally a breath of fresh air. Day after day we are treated to new ideas, actions and the promise of more good news to come. Perhaps nowhere is this phenomenon as exciting as the explosion of new ideas known as the "Green New Deal." This initiative is unique in several ways. It has burst on the scene as an amorphous policy-like movement, instead of as a fully formed piece of legislation. It has originated largely from the House of Representatives "freshman class" rather than the established leadership of the house. It is very much a work in progress and will require a good deal of work to progress. 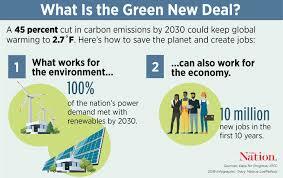 Certainly a good deal of that work will be focused on answering three basic questions about the Green New Deal. First, is it green? The answer here is a resounding "yes." Despite its amorphous nature there is a solid core of environmentalism in this initiative. Much of that is due to the young age of many Green New Deal aficionados. This is relatively easy to understand. After all, young people all over the world have come to believe that solving our environmental problems will be largely their project. Previous generations have done part of their part by educating tomorrow's leaders but the burdens, and the opportunities, will fall mainly on the shoulders of today's millennials. They will make the Green New Deal green. Next, is it New? The answer here is yes and no. 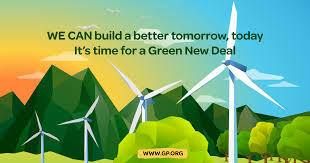 A Google search reveals the fact that the language "Green New Deal" is not new, it has been used before, most often in efforts to create a comprehensive rallying cry for formation of a broad-based coalition combining economics, environmentalism and government initiatives. Like the original New Deal as presented and championed by FDR this effort features the ability to expand its definition, and its composition, to build a coalition with the ability to succeed. Clearly, this current effort is not all that new, but the enthusiasm and energy demonstrated by its growing numbers of dedicated supporters may well guarantee a more successful effort. Finally, is it a Deal? Not yet. Whatever form it takes, if this Green New Deal is to become reality it must be inclusive and be able to handle and resolve the multiplicity of views and opinions that form our body politic. We are now experiencing an emergency. Our inability to sustain our species at its current rate of consumption and growth is no longer in question. The science is overwhelming. If we do not unite and commit to plans and practices that can become universal our future will be radically worse than anything we have experienced in the past. These facts leave us with a basic question. How can we overcome our tendency to squabble and delay and turn the Green New Deal into a reality? The good news is that here in America we have a history of successful efforts to meet and overcome challenges that approach the scale of our current calamity. When the original New Deal was conceived it was an economic stimulus and promised to create jobs and the economic activity necessary to defeat the depression. When implementation began the Second World War was a decade away. When it arrived the work done under the New Deal banner meant that we could immediately convert our manufacturing base to a war time footing. The New Deal did not end the depression, what it did was prepare the nation's infrastructure, both economic and physical for the effort that the war required. The moon landing was a perfect example of the power of the national will, as was the Manhattan Project. Time after time Americans, and other nations, have stepped up, joined forces and focused our will and our resources on monumental tasks. We know how to defeat the climate crisis, we have the skill and resources necessary. What we have lacked, so far, is the ability to overcome politics and get busy doing what needs to be done. Ideally the Green New Deal should be apolitical. However that is not now true. As a result it is up to us all, alone and together, to make our own decisions and to follow through with them. A good place to start is to educate ourselves about the arguments for and against an international leffort. To begin, here is a link to a Google search on Green New Deal Advocates. It is also an excellent idea to familiarize ourselves with the opposition. 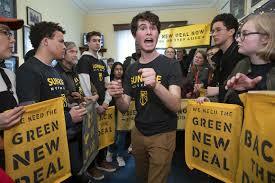 Here is a link to a Google Search on Green New Deal Opponents. For a more in depth review of the Green New Deal, and a look at a major lobbying effort supporting this bold new initiative check out our Winter 2018 issue -- CAN WE INNOVATE OUR WAY OUT OF OUR CLIMATE CHANGE CHALLENGES? For a video review of the sponsoring organization, Citizens Climate Lobby, and their signature legislation click here. Finally, above all else we must begin immediately to defeat this monster of our making. Time is not on our side but we still have time to prevail.